For a free Google tool, Google Analytics packs in a whole lot of useful data. 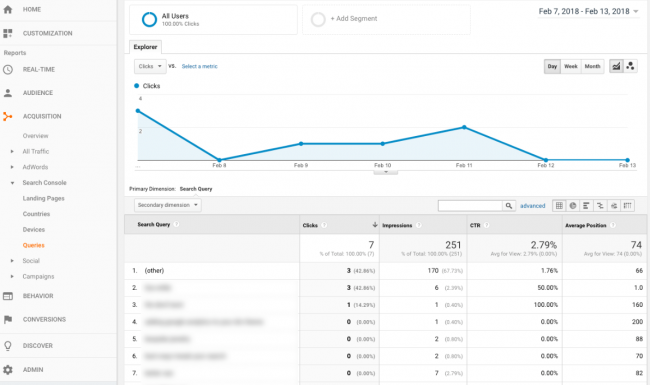 Did you know that you can also use Google Analytics to track your keyword rankings? Free keyword ranking data, straight from the horse’s mouth (Google). The setup process is a bit involved. And the data isn’t that thorough (or easy to understand). But don’t worry, we’ll take you through the steps of tracking your site’s keyword rankings in Google Analytics, plus show you how to get better insights into your keywords that will improve your SEO strategy. Before you dive into GA with your guns blazing, you need to make sure you’re targeting the right keywords on your website. Tracking low-value keyword rankings does nothing to move you toward your goals. Branded keywords. If you have a brand name (like “Monitor Backlinks” or “SEMrush”), you’ll want to rank for that keyword. People searching directly for your brand name already know of you and are therefore easier to convert. Make sure to include common spelling variations as well. Category/informational keywords. Unlike the first two categories, these keywords represent a lower level of buyer interest. However, there’s a significant opportunity here to capture leads. Ranking highly for this keyword category also tends to position your company as a thought leader worth following. If you don’t have any keywords in mind yet, or need to refresh your keyword research, you can use our guide to get started. As a general plan of attack, I recommend first targeting branded keywords if your company has a reasonably strong brand presence. Then, focus on buyer intent keywords since those have a higher likelihood to buy. Finally, play the long game by working on category and informational keywords. Now, let’s find out how you’re ranking for those keywords! Follow these steps to make the best use of the free keyword ranking data available in Google Analytics. You’re probably already using Google Analytics to track a range of SEO metrics for your website. While Google Analytics is a great tool, it can actually work even better when combined with other Google tools. Specifically, I recommend combining it with Google Webmaster Tools. For this step, you’ll need a Google Analytics account and a Google Search Console account. The tools are freely available to anyone who owns or runs a website. If you’re not already using them, you’ll need to set up an account with both. This is going to get a bit technical, but it’s worth it. Just take it one step at a time. B. 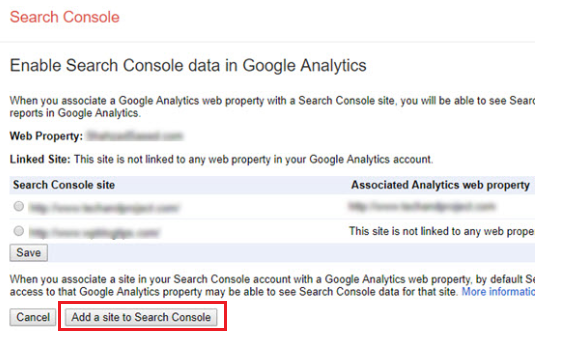 In “Property Settings,” scroll down until you see the “Adjust Search Console” button. C. In the Search Console Settings screen, click the “Edit” link to add your website. Then, just follow the remaining steps provided by Google to complete the setup process. What happens if you don’t see any data? This can happen for a few reasons. Let’s break it down. Not seeing any traffic? It could be because your site is still new. If you only launched your website recently, don’t expect to see any traffic. Can’t complete Google Analytics setup? Google Analytics might be down. Check that it’s working by viewing your website on a mobile device, and then see if that visit shows up in Google Analytics’ real-time traffic. Can’t connect your Google accounts? This integration process works best when both of the Google accounts are associated with the same email account. If you manage multiple websites, this is a common failure point. If you’re still having problems, you can always consult the official Google setup instructions. From time to time, Google changes the layout and design of their pages, so refer to their guide for up-to-date details. By this stage, you should see live data in Google Analytics complete with keyword rankings. To view your keyword rankings in Google Analytics, start at the Home screen. A. Click on “Acquisition” on the left-hand side. Now, what do all those numbers mean? Use the following criteria to analyze your keyword rankings. Search Query. This is the keyword or phrase that you’re ranking for. Clicks. Rankings alone don’t mean much—you need to get traffic (clicks) to your site as well. Once you’re getting upward of 100 clicks per month for a given keyword, there’s value in tracking conversions. That’s the fast and simple way to track your keyword rankings in Google Analytics. As you can see though, these insights have limitations. If you want to track particular keywords that are relevant to your strategy, find out how specific URLs are ranking for specific keywords, or how your rankings compare to your competitors, you’ll need to supplement Google Analytics with another tool. For that, I recommend Monitor Backlinks. Using Monitor Backlinks’ keyword rank tracking feature, you can mine more and better insights from your basic GA data. For starters, you can add the keywords you want to track. Instead of the odd assortment of keywords that Google shows are resulting in traffic, you can track only the keywords that matter to your SEO campaign. You also get a nice overview of your average keyword rankings and how they’ve grown over time. 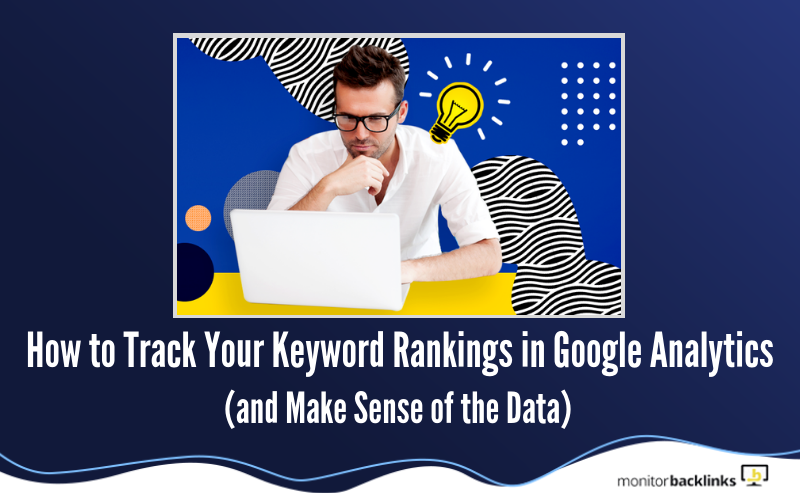 To dig further into your keyword ranking data, scroll down to see your current ranking position for the keywords you’ve added for tracking (including the URL of the ranking page), as well as how those rankings compare with your competitors. This capacity to compare and contrast your keyword rankings to competitors makes Monitor Backlinks a great tool to supplement with Google Analytics. It can help you discover what keyword opportunities your competitors are working on, and unearth areas where they’re falling flat. Another valuable feature of Monitor Backlinks’ keyword rank tracking is the ability to track your progress over time, from a month to a year to forever. This longer, customizable time horizon matters for strategies like content marketing, which typically takes longer to deliver results. Want to try out Monitor Backlinks for yourself? Make more sense of your keyword rankings with a no-risk free trial! There are many different ways to track your keyword rankings, but the truth is, you don’t need to over-complicate it. Start with three good SEO tools—Google Analytics, Search Console and Monitor Backlinks—and learn how to use them effectively. That leaves you to spend the rest of your time and energy on other marketing tasks—like winning more backlinks!